How old is the building ? The building where the apartment is located was built in 1903. 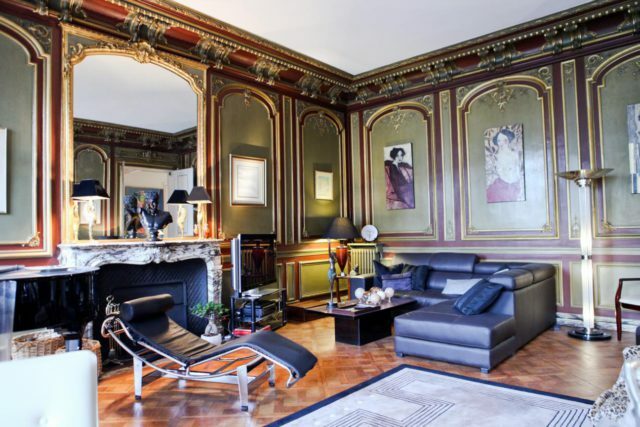 Built towards the end of the Haussmanian period, it is an exceptional example of Haussmanian architecture. Did you have the apartment specially built for you? As the owner, I renovated the property completely to my own taste and lifestyle. My hobby is finding exceptional property and restoring them with the utmost attention to design and quality. What attracted you to such an amazing design? What attracted me to this property was that it is really a tribute to the Haussmann exterior architecture and interior of the period and that it was still virgin state when I bought it. The original features were intact, although badly in need of being brought back to their glory. I really enjoy the restoration process and especially appreciate my ornate mouldings, Versailles-style parquet floor, gold leaf detailing, exceptional ceiling height. I also enjoy the contrast of my eclectic mix of furniture spanning different periods such as art deco. What is it like to live in such a apartment ? I love living in this apartment. It is extraordinarily comfortable, a place where I can relax and being so spacious, I often receive guests who appreciate the different intimate spaces of the apartment, ensuring that everyone has their own favourite private space. What was the apartment like when you bought it ? I saw the potential from the moment I walked in, and I immediately noticed that the authentic Haussmann features of the apartment. It gave you the sensation that it was a family home, with a long history, which needed a bit of love and attention to bring it back to its old glory. What attracted you to the location? The quartier is one of my favourite parts of Paris. Being a five minute walk from Parc Monceau and the Champs Elysees, you enjoy the best of being in the centre of Paris and also having the green open spaces of Parc Monceau. I enjoy the view of the traditional Chinese Pagoda from my apartment and especially from my terrace as it transports you to another world. The life quality is very special.